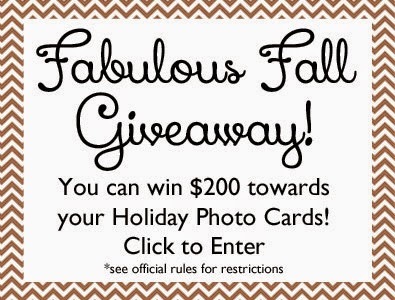 We are so excited about our new Fabulous Fall Giveaway! We can't wait to share it with you! This October we are giving away $200 towards one lucky winner's Holiday Photo Card selected from the stylish and festive designs on our Printswell sister site. You can check them out here. There are so many to choose from! Stripes, polka dots, snowflakes . . . from one photo to multiple photos, there is sure to be the perfect one for you. AND, to make this even more fabulous, as we receive more entries, we will be adding to the prize! That's right! As entries in our giveaway grow, we will be adding amazing goodies like FREE printed invitations for your next party, 5 sets of personalized stationery, a set of matching holiday return address labels, and some surprises . . .
You can enter here, and keep in mind there are multiple ways to enter, from Liking our page on Facebook to Following us on Pinterest. Also, remember to share, share, share with friends. The more our entries grow, the more we add to the giveaway!